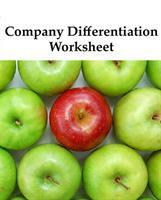 Use this FREE Company Differentiation Worksheet that iKANDE uses with their successful clients to gain more business by targeting what separates you from your competition. Answer these 6 tell all questions and you’ll be looking at your business in a whole new light. Gain more business by targeting what separates you from your competition. Answer these 6 tell all questions and you’ll be looking at your business in a whole new light.